The value of a DofE Award to a young person cannot be underestimated. The personal and non-competitive nature of a DofE programme enables participants from different and diverse starting points to be equally proud of achieving their award based on their personal challenge and journey. At the moment Westhaven School offers students the opportunity to take part in a Bronze DofE Award when they are in Year 10. A DofE programme is a personal challenge which is tailor-made to suit personal circumstances. This will reflect a young person’s individual starting point, abilities and interests. Young people design their programme to suit their personal circumstances, choices and local provision. Expedition: Planning, training for and completing an adventurous journey in the UK. 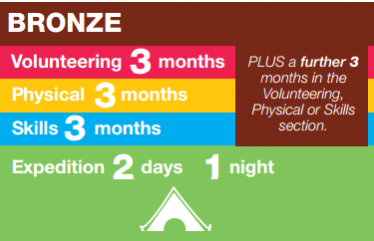 Whilst DofE timescales are expressed in months, participants need to give a regular commitment averaging at least an hour a week during this time.